Apple's pursuit of providing users better devices never stops, as with the buzz around the new Apple devices never dissipates. While the next-gen iPad fever has just died down, rumors about iPad Air 3, an iterative update to the current best tablet iPad Air on the market, are floating about. Surely it will come with more improved abilities. However, right now it needs time to figure out how much better iPad Air 3 will be and iPad Air 2 is still device to play and watch movies videos. 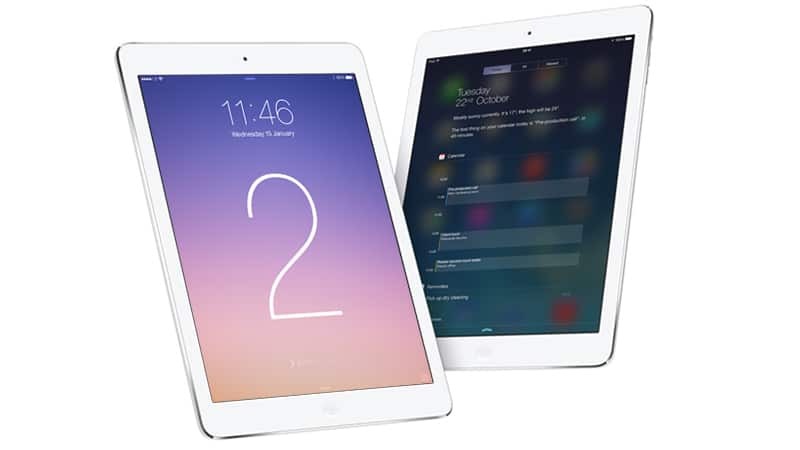 What are the formats supported by iPad Air 2? How to smoothly play videos movies in various formats on the new iPad? Today we are going to tell you the detailed iPad Air 2 supported formats together with simple guide on how to convert various videos to acceptable formats for iPads without quality sacrifices. Design: iPad Air 2 measures 240 x 169.5 x 6.1mm and weighs 437g, while iPad Air 3 will measure 240 x 169.6 x 6.15mm, almost identical size with iPad Air 2. Display: Air 2 comes with a resolution of 2048 x 1536, which means it offers a pixel density of 264ppi. Compared with iPad Air 2, iPad Air 3 will go up to a resolution of 3112 x 2334, a pixel density of 401ppi. Apparently, both iPad Air 2 and 3 are ideal to watch HD videos on. Hardware: Air 2 pairas with the A8X chip and the M8 motion co-processor. But Air 3 will include a faster processor. But it's unkown whether it's A9X in the iPad Pro, or an new chip named A10. Summary: iPad Air 3 will bring many improvements for sure, but iPad Air 2 is also good enough to stack against Air 3. In view of the fact that iPad Air 2 is still a good device to enjoy videos movies, detailed iPad Air 2 video formats are still in need for that it's really frustrating that when you brought some hot DVDS or downloaded lots of video clips but only to find that they were not playable on iPad. Therefore here we list all the iPad Air 2 supported video formats and how to convert DVDs and common videos to iPad Air 2 supported video formats. As many videos and movies are of video formats like MKV, FLV, WMV, MTS etc that do not belong to the above iPad Air 2 supported video formats, you will inevitably need to convert those videos to video formats for the new pad. 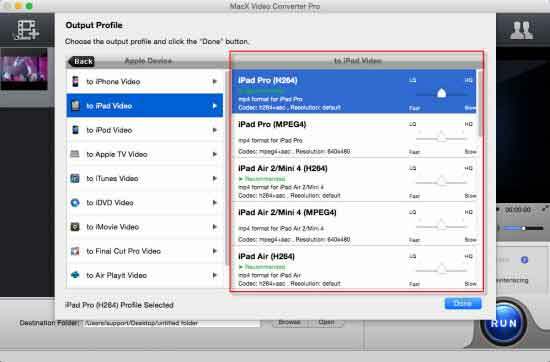 In order to convert video to video formats for iPad, the professional video converter with the name of MacX Video Converter Pro will be your best aid. Not only can it convert any video including AVCHD, MTS, FLV, WMV, MKV to iPad Air 2, but it also can directly convert videos to Apple iPhone, iMovie, iTunes, Apple TV, Android, Microsoft, and more with one click. Step 1: Run the iPad video converter, click "Add Files" to load the video. Step 2: Choose one of the video formats like MP4, MOV, or M4V. Or you can choose iPad Air 2 directly from the device profiles list. Step 4: Click "RUN" button to start converting video. The whole process is 32x faster with no quality loss. As iPad Air 2 is an ideal mobile device to enjoy HD and blu-ray videos, it would be a great pleasure to play DVDs on it. In this case, MacX DVD Ripper Pro, a professional DVD ripper, is exactly what you need. 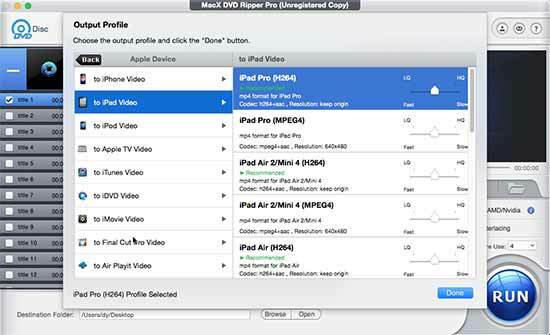 Built in nearly 300 profiles, it can help you to rip DVD to iPad easily, including those protected by Disney DRM X-project or the common CSS, Region Code, UOPs, Sony ARccOS and other copy-protection technologies. Step 1: After launching the DVD ripper for iPad on Mac, import the DVD you want to convert by clicking "DVD Disc" button. Step 2: You can choose iPad Air 2 directly by clicking "Apple device" in the output profile menu or choose an one of the above iPad Air supported video formats. Tips: You are also allowed to rip DVDs to iPad supported video formats. Step 4: Hit the "RUN" button to start to rip DVD on Mac. You can view the conversion process or cancel it at any time.